The Long Weekend is a graphic novel that has been adapted from an essay that explores the idea of the Cultural Complex; one of Carl Jung’s early ideas about group behaviour that was left largely unexplored until very recently in the academic world. Craig San Roque, the author the original essay, acts as narrator and protagonist. 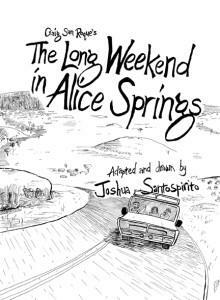 He takes the reader throughout a long series of poetic thoughts, places and over the course of a long weekend in the central Australian desert town of Alice Springs whilst he grapples with an analysis of his own culture and the pain which it intentionally and unintentionally inflicts upon other cultures. Moving, challenging and dangerous, The Long Weekend is a haunting comic, both shockingly funny and supremely uncomfortable to read. It’s images will linger with you after you’ve placed it upon your bedside table, turned off the lamp and settled into a restless sleep.